No hole is too deep to climb out of…except when Masahiro Tanaka is on the mound. I am seriously concerned about Tanaka after his latest disaster. In Fantasy Baseball, I’ve seen many owners dumping Tanaka from their rosters for no return. I am not suggesting that the Yankees cut him and I am hopeful that he rediscovers his touch. But as the New York papers are screaming, Tanaka is in full-blown crisis mode. You have to admit that this is very disconcerting. For a rotation that had many questions coming into the season, none of the questions were directed at the team’s ace who is, right now, the rotation’s weakest link. I am not sure what has to be done. They’ve tried different arm angles and placement on the the pitching rubber, but Tanaka’s pitches are still getting hammered. Kevin Kernan of The New York Post had the best line, “that just meant he had a different view of baseballs zooming out of the ballpark”. 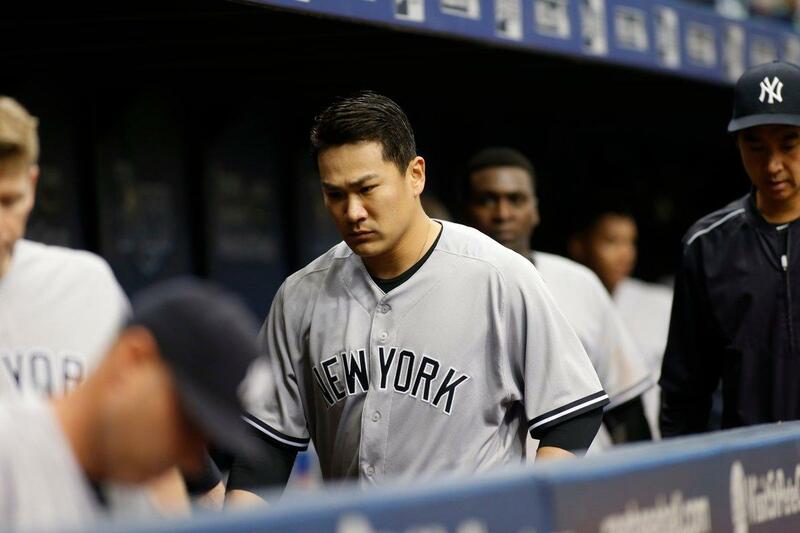 In Saturday’s 9-5 loss to the Tampa Bay Rays, Tanaka lasted only three innings. Rays hitters got nine hits and six runs off Tanaka, including three home runs. Tanaka (5-3) also walked three batters in the loss, which elevated his season ERA to 6.56. In his last two games combined, Tanaka has given up seven home runs in 4 2/3 innings…and fourteen friggin’ runs. At the beginning of the year, the fear was that Tanaka would opt out of his contract at the end of year. Now, the fear is that he won’t. My first thought at the latest stinker was the partially torn UCL in his elbow, but the Yankees insist he is healthy. Of course, their recent “surprise” about Aroldis Chapman either tells you that the players are not always being honest with the team or the team is withholding information. If Tanaka is healthy, then this scares the h**l out of me. At this point, I am probably in favor of skipping Tanaka in the next run through the rotation to give him extra time to right the ship. There’s no doubt he lost his splitter and slider on one of these recent road trips and can’t remember where he left them. As for the game, the Yankees did get home runs from Aaron Judge and Gary Sanchez. Nevertheless, this was a game we’d just as soon forget. 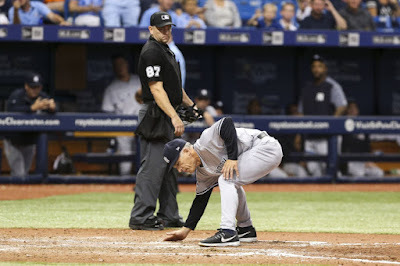 Both pitching coach Larry Rothschild and manager Joe Girardi were tossed in the fifth inning for arguing balls and strikes. Girardi even covered home plate with sand and the ump (Scott Barry) refused to clean it. Gary Sanchez finally took it upon himself to wipe home plate. Speaking of Sanchez, he didn’t play on Friday night due to a stiff neck so I’ll take Rob Thomson off the hook for not using Sanchez as a pinch hitter in the loss. I just hope the foul tip Sanchez took off the mask yesterday doesn’t worsen his health concerns. 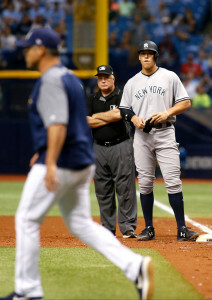 Rays starter Matt Andriese was tossed in the sixth inning for plunking Aaron Judge with a pitch. Tommy Layne had hit the Rays’ Corey Dickerson in the back with a pitch the prior inning. Dickerson had hit two home runs in the game. The tired lines of ‘the ball got away’ were used but I still don’t appreciate the potential harm to our young slugger. The Yankees (24-16) fell a half-game behind the Baltimore Orioles in the AL East standings with the loss. The Orioles beat the Toronto Blue Jays, 7-5. As losers of three in a row and seven of their last ten, the Yankees are on a faster track to be the 80-win team they were forecasted to be at the start of the season rather than a division contender. Good hitting beats poor pitching every time. Hopefully, the Yankees re-discover the Cinderella slipper sooner rather than later. 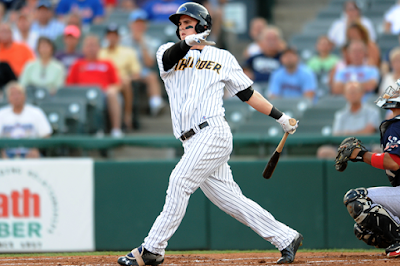 Tyler Austin made his 2017 debut with the AA-Trenton Thunder (rather than High-A Tampa) on Saturday. He went 1-for-3 with a double and a run scored. He was also hit by pitch in the Thunder’s 5-2 loss to the Portland Sea Dogs. The Yankees conclude their three-game set in Florida with the Rays today. CC Sabathia will be on the mound versus the Rays’ Chris Archer. I am really hopeful that we get the most recent version of Sabathia (6 2/3 innings of scoreless pitching) and not the Masahiro Tanaka-version that we saw in the preceding weeks. Have a wonderful Sunday! Let’s have some fun today…finally!